Have you ever noticed how heavy and awkward a loaded fridge can be and how often you need to get something out of it? 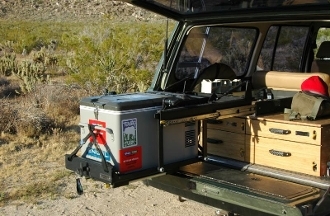 The LoadSpotter Levitating Slide was designed specifically for lifting, lowering and hauling a 12 volt camping fridge over the roughest terrain. Now you can carry a fridge without compromising your storage. Don't forget the Buffalo Straps!